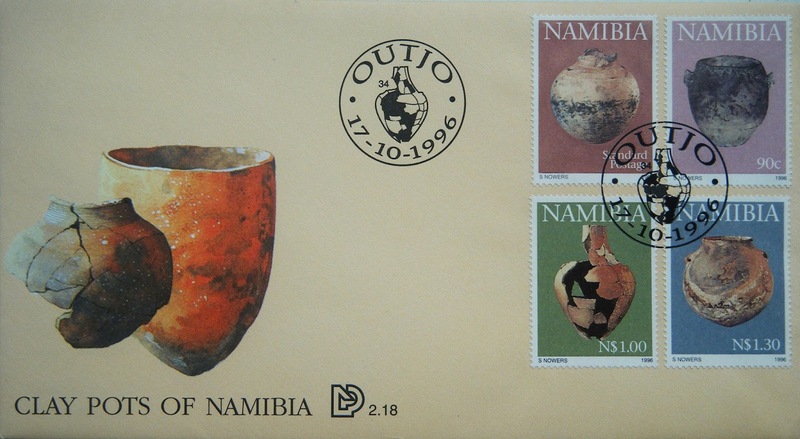 This 1996 'Clay Pots' FDC features storage and cooking vessels from the National Museum's holdings. Clockwise from UL: Approx. 2000 years old, this is decorated by woven fabric impression, and was buried containing hematite. Next, shows a 'bag shaped' vessel c. 14th cent., it was found filled with trade beads in a rock shelter. LR shows a pre-16th cent vessel with lugs and a pointed base, likely used by nomadic pastoralists.